Recently Italy’s answer to the Energizer bunny, distiller and vintner Sandro Bottega, paid a visit to Toronto and Vancouver. In his usual enthusiastic style, he discussed his new products coming into the Canadian market, how they are made, the soil the grapes are grown in and ideas on his organic principals. And, of course, he served us wine and food. 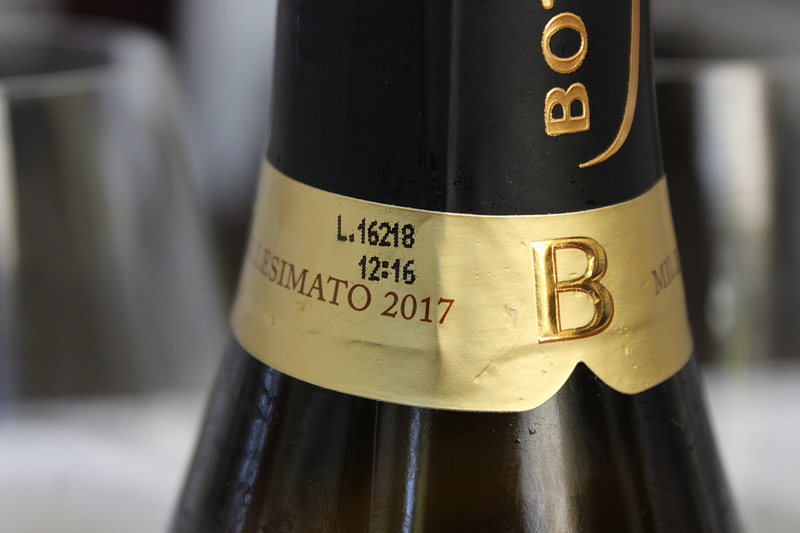 All Bottega’s bottles carry a vintage date, and he treated us to a vertical tasting of his renowned Bottega Prosecco Brut VTG 2013, 2014, and 2016. We noted that the 2013 was not at its best but still maintained its mousse. Prosecco can still be drunk four years after harvest, and the 2016 was crisp and fresh, tasting of apples, which is characteristic of the Glera grape. The tasting also included his Bottega Gold, his entry level Il Vino Dei Poeti Prosecco DOC Brut, Il Vino dei Poeti Rose Gold 2017, Bottega Cino d’Oro Chianti Classico VTG 2015, Bottega Valpolicella Ripasso VTG 2016, Bottega Amarone della Valpolicella 2014 and Il Vino dell’Amore Petal Moscato. Bottega is one of the few companies that also directly manage wineries in Valpolicella and in Montalcino. Sandro plans on purchasing an additional 35 hectares in Montalcino. His generosity also extended to offering for tasting his personal private aged traditional balsamic vinegar and olive oil. Bottega is also internationally known for a wide range of spirits such as numerous grappas, liqueurs such as Limoncino and Pistacchio, one of their creamy liqueurs, which enters our market in October of this year. They also make Vermouth, both Bianco (using a base of pinot grigio) and Rosso Vermouth (Merlot based). And, lest you wonder if Sandro would be willing to sit back on his laurels, he now distills Gin Bacûr using sage from the Veneto, juniper from Tuscany, lemon zest from Sicily and water from the Italian Alps. He also makes a vodka that’s distilled five times. 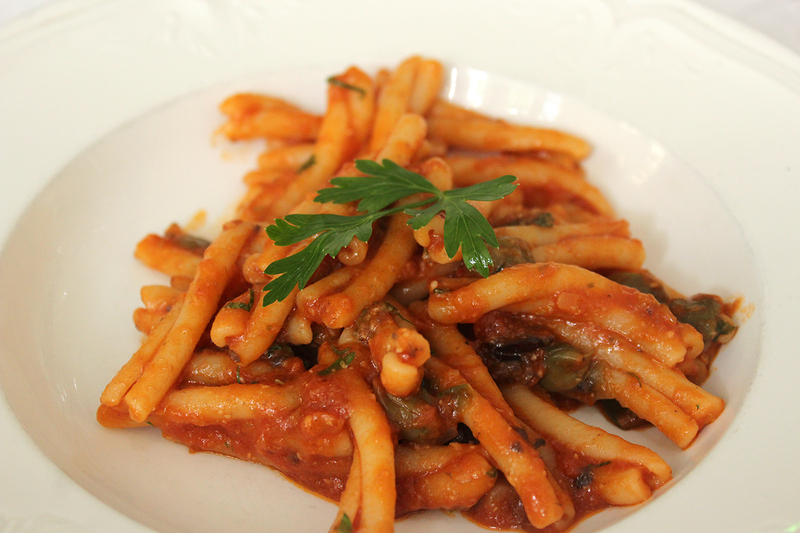 Bottega products were first introduced into the Canadian market in 1991 and are now available in ten provinces. While Bottega’s largest markets are Germany and the United Kingdom, Canada is 10% of their export market. 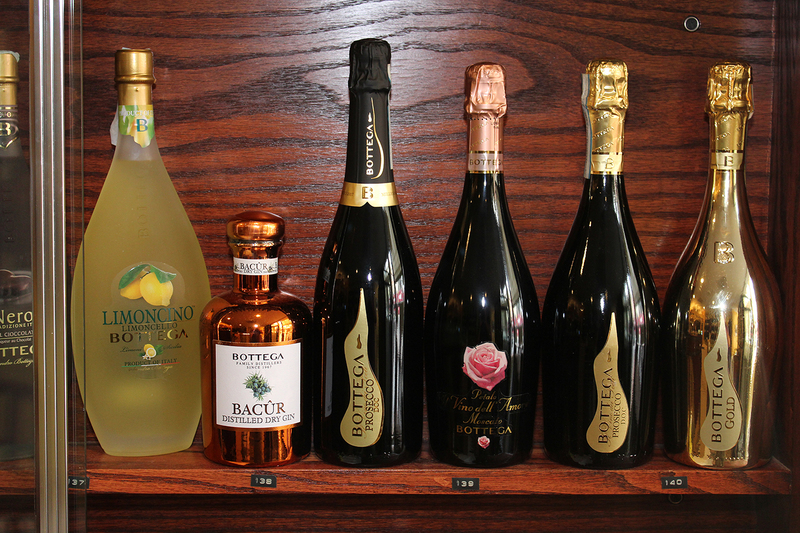 Bottega was number three in the Prosecco market but has quickly moved into second place thanks to its universal appeal. When you’re travelling, you will find Bottega products on 50 different airlines, including two Canadian ones. 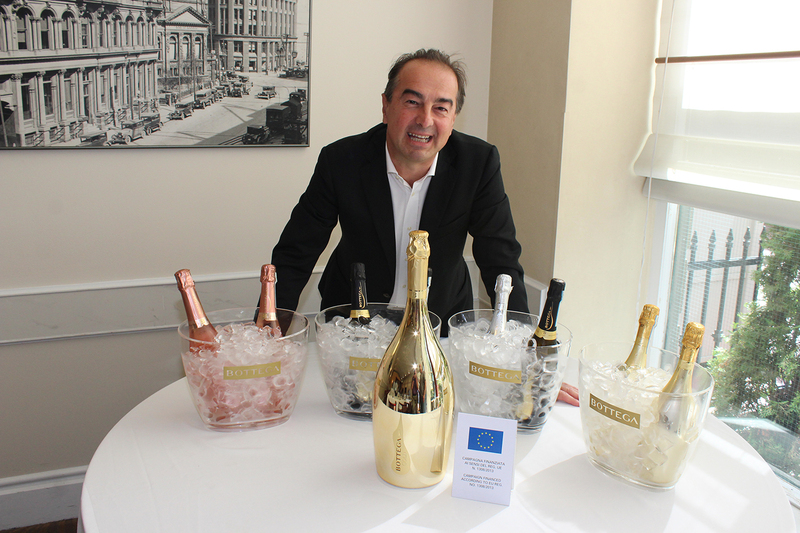 You will also find his Bottega Prosecco Bars in various countries – and on board the Viking Line “Cinderella” cruise ship. Approximately 3000 tourists arrange yearly visits to Bottega’s properties in Italy. Beautiful glass is also important to Bottega. Bottega’s headquarters in Bibano di Godega di Sant’Urbano also house Bottega’s own beautiful designed bottle museum. And the city of Hiroshima now has a stunning, huge, permanent Murano glass sculpture, called the Spirit of Peace, featuring a white dove designed by Sandro he donated for their collection. Sandro’s philosophy is to provide the consumer with the very best. He strives for that and only when he is satisfied that he has fulfilled that vision will he release his products into the market. He is continually tinkering. His latest is a new dry sparkling wine, Il Vino dei Poeti Prosecco Superiore DOCG “Rive Di Guia,” for the more sophisticated palate. And for his Gin Bacûr, he will replace the grain alcohol with grape alcohol. Family is everything to Sandro. His siblings are involved in the everyday operations of the company, and he hopes that one day his niece will continue with his drive to supply the world with the very best of Bottega’s products. 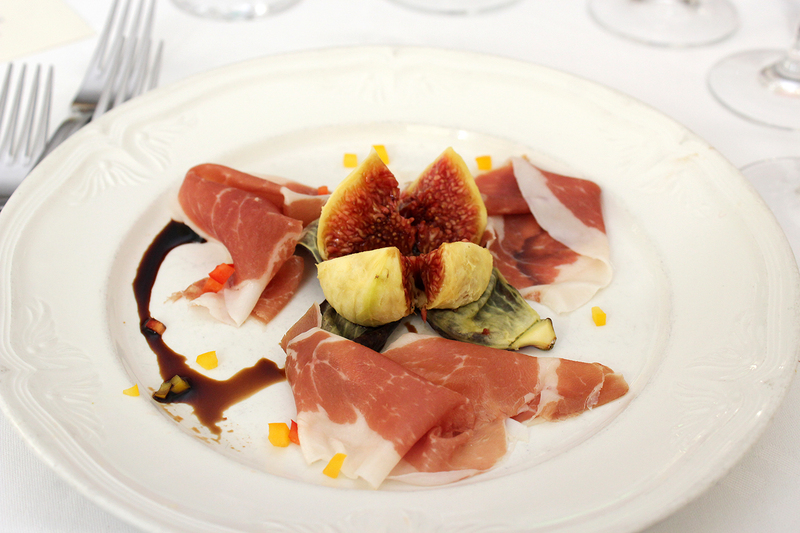 The Bottega Tasting, Seminar and Luncheon for Media was held at Biagio Ristorante in Toronto. A reception after the seminar was held in the restaurant’s garden and featured appetizers of cod fritters, polenta with a mushroom topping and small baked new potatoes stuffed with burrata and bottarga accompanied by the Bottega Gold. Pour the Gin Bacur into a stemmed glass, add the peach juice, mix. 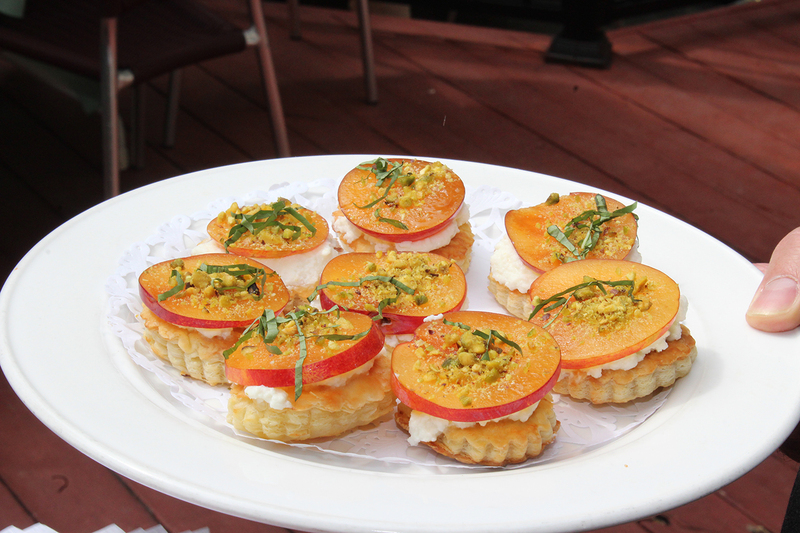 Top it up with chilled Prosecco. 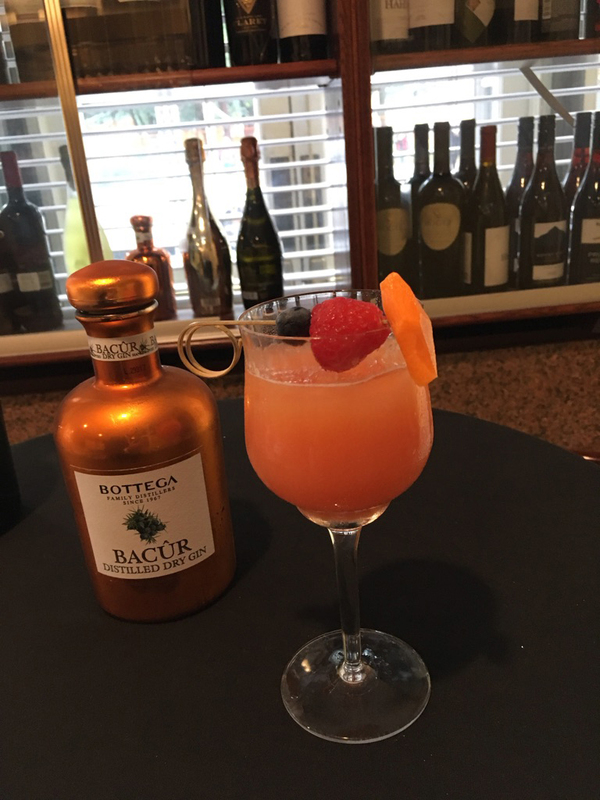 This entry was posted in Guest Articles and tagged Bottega, Gin Bacûr, prosecco, Sandro Bottega, Sheila Swerling Puritt. Bookmark the permalink.